The first day of SharePoint TechCon San Francisco has come to a close and it didn’t disappoint. I came into this conference with a number of questions to answer, many of them surrounding InfoPath and Workflow and what Microsoft’s vision is for the replacement. That question was answered. In short, it’s PowerApps and Flow, but more on that later in the review. So with all of these statistics in tow, the question of “Is SharePoint Strategic?” or “Can SharePoint be Strategic?” was left to be answered. So we first stated the first mantra of leveraging SharePoint: “SharePoint is not JUST a document management system… if you’re treating it as such, you’re doing it wrong.”. People make the mistake of using it just for document management and fail to release its true strategic power. So, SharePoint can be a very powerful tool as a part of your overall IT strategy. 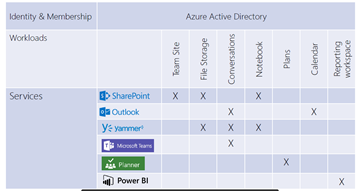 As you can see, SharePoint is just one “piece in the pie” of a more wide-reaching overall IT Strategy. Most importantly, you need the executive sponsor to “drive the plane”. Eric used this great analogy about when you travel by plane. You can’t see in front of you, but you know that the pilot is in the cockpit… driving the plane forward, adjusting altitude to avoid turbulence, and potentially taking a better route as conditions change. All the while the pilot is coming over the speaker informing you of progress or potential need to adjust course. This pilot is the executive sponsor, the crew is the SharePoint team, and the passengers is the enterprise. With this sponsor, SharePoint can not only succeed, but achieve its strategic potential. Mapping out your SharePoint Journey – Executive Buy-In, Portal Adoption, and creating an Information Hub are most important. Define why you are using SharePoint – ie, Engage Business Stakeholders, Enterprise Collaboration and Workflow, Transcend how work gets done, etc. Define who owns SharePoint – All too often, the owner is unknown, which causes a lack of ownership, which causes SharePoint to just become “another tool”. Social – Use Social as a strategic pillar. Finally, Eric presented a quote that I’m going to shamelessly steal: “If I’d asked customers what they wanted, they would have said, ‘A faster horse’.” – Henry Ford. The idea is that they really wanted a more efficient form of transportation, but sometimes the end user thinks in terms of their current model. Ability to filter and save a view. The “single column” layout and associating core master page allows for a “reactive” environment out of the box. So you don’t have to worry about reactive design… it does it for you. PowerApps and Flow are the successors of InfoPath and SharePoint Designer Workflow. That said, in the current versions, they really aren’t there yet. I did ask the question, Is the fluid and reactive mobile experience the primary justification for not doing advanced branding on SharePoint Online? Her response was, If you do embark on a branding effort, just know that you pay a tax for this. Every time there is an update, you may have to have resources on staff to fix the things that broke. I heard the concept of “paying a tax” from other presenters as well. The true message here is: Don’t Brand your SharePoint Online sites! You’re really just asking for trouble and headache down the line. 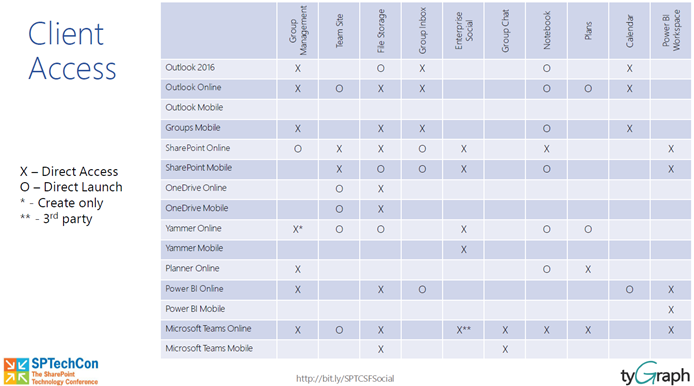 Groups and Teams and Yammer and Modern Team Sites, Oh My! Walking into this session, I knew that Microsoft Groups and Teams were areas that I just needed education on so I was there that just to be a sponge. I will say that as I heard more and more, I came to understand that Groups and Teams are very important pieces of Microsoft’s cloud strategy and deserve a considerable amount of attention. Although there are a number of client applications that use and implement Groups differently, at its core, Microsoft Groups are simply Azure AD objects that provide Identity and Management that are used across many cloud offerings. So, for example, when you create a Group, that Group can then be used with Exchange, Power BI, SharePoint Online, Yammer, and yes, Microsoft Teams. 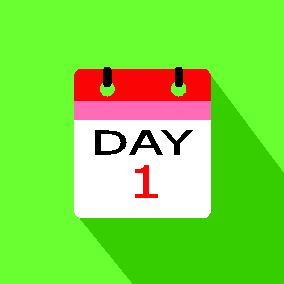 But, then, you might be asking: “What a minute, when I set up a SharePoint Online Group, I get so much more including a calendar, storage, and Planner!” Well, that is true. Those are the workloads that then different services can provide, but at the core, Groups are really just the AD objects. The important take-away was that each client provides different access to the different services. Microsoft Teams was the one that offered the most wide-reaching access to these services. With all of the collaboration features of Microsoft Teams, it could really become the replacement for Skype For Business Client. Microsoft Teams Chat allows for the “forum-like” structure and the more-direct saving of conversations. This allows for the ability to look back to see exactly what people said and meant at a point-in-time. Planner is not intended to be a replacement for Project Server, but rather a replacement for the Gantt view in SharePoint. SharePoint wants to get out of that game. The final point that’s worth mentioning which answers to a degree one of my questions coming into the conference: How should I be thinking about Yammer as a part of the overall toolset? The way John described it was to think of Yammer and compare it to Microsoft Teams the same way we think of publishing sites vs. collaboration sites today. Just like publishing sites are for content with the entire enterprise as the audience, that is how we should think of Yammer’s role. You would see the Yammer feed on a publishing site and those conversations are intended for the enterprise. So Yammer is social for the enterprise, or Enterprise Social. Teams is used for team chat. That is, this social experience and conversations here are intended to have a smaller audience consisting of members of collaborative teams as the primary audience. It seems that Microsoft is getting better at their Yammer positioning, but to me, it’s still a bit vague. I think Microsoft has to either better integrate the Yammer brand into all the offerings or take the technology, but retire the brand. That said, I did ask about all of the social data and how it would impact relevance in other parts of the product suite. John did say that this information will feed into Delve and contribute to what information gets surfaced to the end user. That is very interesting to me so I will be paying close attention to see how that develops. Unfortunately, Laura’s talk was so invigorating that I have very few notes on this one J. Pulling from memory, though, Laura took us through a demonstration of a product ordering system completely built in Power Apps. As was mentioned multiple times throughout the conference, Power Apps is Microsoft’s answer to What is going to happen with InfoPath? They say that this is the successor to InfoPath meaning that we shouldn’t expect all the features to translate 100%. That said, I did see some things that we can do in Power Apps that are difficult in InfoPath as well. There were some big takeaways, though. First, when we think of InfoPath, there really are 2 primary functions where we use it: Form Customization and Form Library Experiences. I see PowerApps as a better parallel to the second. PowerApps will allow you to create a rich experience including various views, forms with logic abilities in a very mobile-friendly way. Also, in the same parallel, there is a PowerApps application that launches to allow the end user to interact with app. As of now, there is nothing like Forms Services, allowing a Power App to be launched in a browser. I have to believe that this is coming. It’s just the natural progression of the tool. Also to note is that there are 2 ways to start creating an app. One is through the PowerApps application itself. Going this route allow you to choose 2 different templates: Phone View or Tablet View. As you could imagine, the Tablet view gives you more real estate to work with. The other way is through the SharePoint interface itself. Going this route, however, only gives you the Phone View. So pick your method accordingly. When it comes to using PowerApps as a replacement for customizing New or Edit forms, you could do that using the same method, but in the current iteration, it’s not as clean as InfoPath. Should you add or delete fields in the SharePoint list, you would need to also go into the PowerApp for the form and make the adjustments there as well. I’m hoping for a more robust path in the future. Andrew’s presentation was one of those abbreviated sessions so that we could have time to walk around the vendors to listen to their pitch and collect our obligatory SWAG, but his presentation was good although improperly titled. What it should have been title would be “How to set up your Information Architecture to provide for a better search experience”. He went through several best practices around IA including ensuring the lexicon makes sense for the business, use Managed Metadata to allow for hierarchical information classification, and leverage various tagging mechanisms. All great things to know and follow… just not really tied directly to moving content to SharePoint Online. This was really a great panel with an amazing cast of characters. Susan Hanley believes branding is evil where Cathy Dew believes the complete opposite. John is the King of BI where Eric has similar stature around development. So the personalities and their banter with each other made for a refreshing end to a mind-filling day. They took questions both from the audience and from Twitter (for those too shy to stand up to the microphone). There were a number of questions around Office365 groups, Teams, PowerApps and Flow, but the big takeaway I had was that we just have some really talented and obscenely smart MVPs as a part of our community and we are damn lucky to have them.